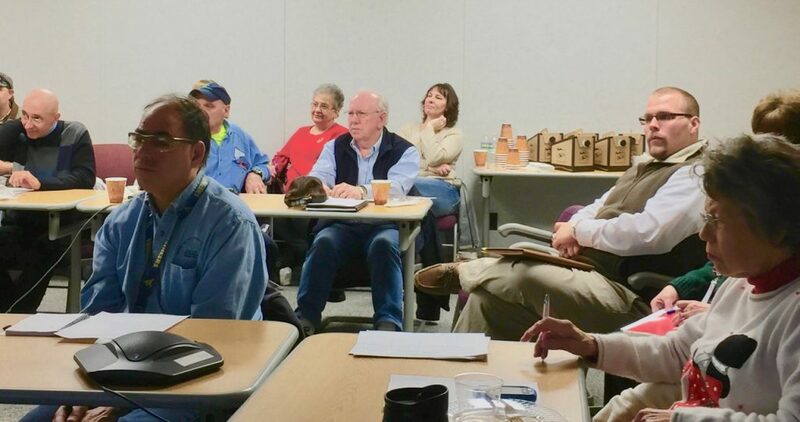 Pantry reps see greater need coming in Winter 2017 | United Food Operation, Inc.
Food pantry representatives who participate in United Food Operation (UFO) gathered recently at Dow’s Institute plant to plan this winter’s assault on hunger. The consensus is they are seeing lots of new faces at their pantries this year, so they need to double down to get through the winter. Representatives from the Salvation Army in Charleston say they are seeing folks today that they haven’t see in three or four years. With these people added to the regular clients, resources are under stress. They also report seeing an uptick in the number of homeless. The Salvation Army has extra refrigeration space that could hold perishable food but they lack a supermarket partner to provide perishable food to them. Mountain Mission on Charleston’s West Side says its new Soup Kitchen has increased awareness of their food pantry within the community. Demand for food is up but the soup kitchen has helped them tremendously in serving the community need. The Covenant House of Charleston representative reported a common pantry observation this year: bigger families. Where in the past, the typical family size served was three to four, it is now not uncommon to find six or seven. The feeling is that more people have lost their jobs and moved in together in an attempt to economize. 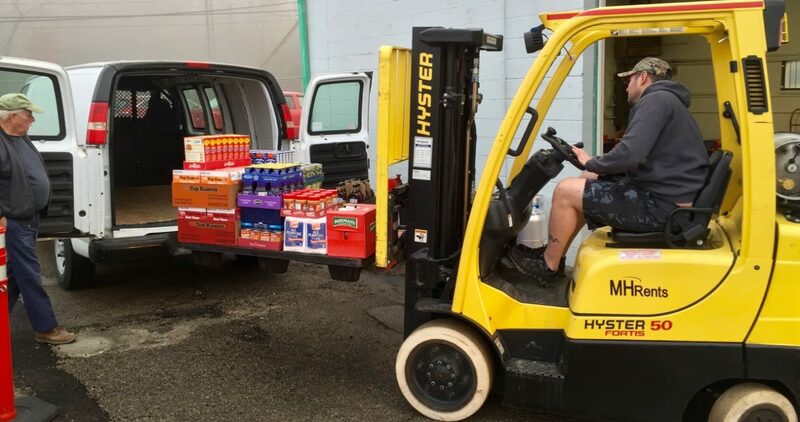 Covenant House has found success in partnering with Manna Meal of Charleston to receive its excess food donations that are then distributed though Covenant House’s food pantry. Christian Community Cupboard, which serves the south side of Putnam County, says it is seeing larger family sizes and expects to need food resources to serve 4,000 families in the coming year. 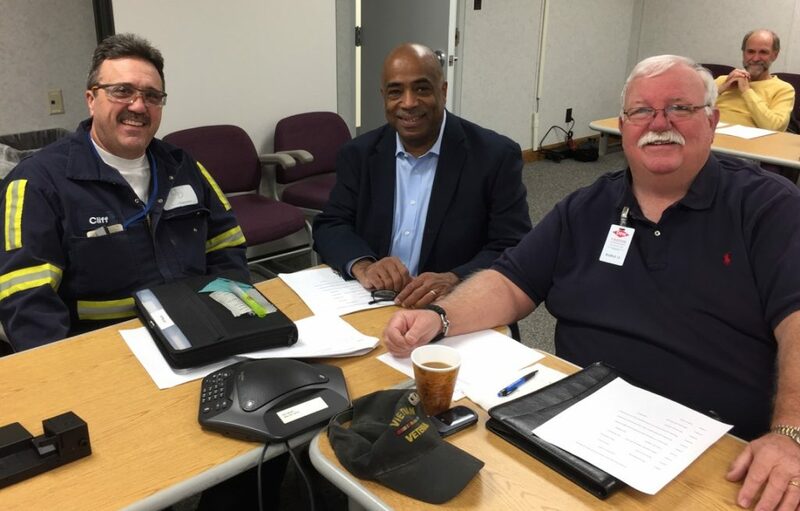 Key volunteers for United Food Operation include, L to R, Cliff Means of Bayer CropScience, Joe Davenport of Dow, and IAM retiree Joe Gresham. A representative of Heart & Hand Community Services, South Charleston, said they are definitely seeing larger numbers of requests for food. People are lined up the whole day, they say, as they serve 15-20 families a day. Heart & Hand has moved back to its former location on D Street in South Charleston, but with added space that was formerly a daycare center. Now that have more space, they could use more resources to program it. Food is going out faster than it is coming in, their representative said. St. Albans Food Pantry representatives say requests for food are up 10% over last year. They are also seeing a larger number of single seniors. Five Loaves, Two Fish, which serves the northern side of Putnam County, has also seen lots of new people showing up. This year they did not have a business/organization sponsor for their Thanksgiving turkey distribution this year. They had to pay for the 225 turkeys directly out of pantry funds. They are seeking a sponsor for their Christmas turkey distribution. Nitro Food Pantry is serving 125 families per month and needs more resources to help with the growing numbers of requests. 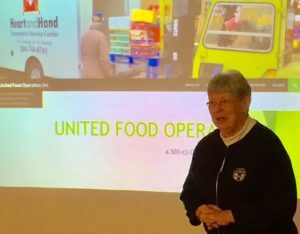 All these observations put pressure on United Food Operation to work extra hard to provide the extra food needed to get the pantries through the tough winter season. Demands on food pantries tend to increase in winter as households heating bills go up with the cold weather putting more stress on family financial resources. 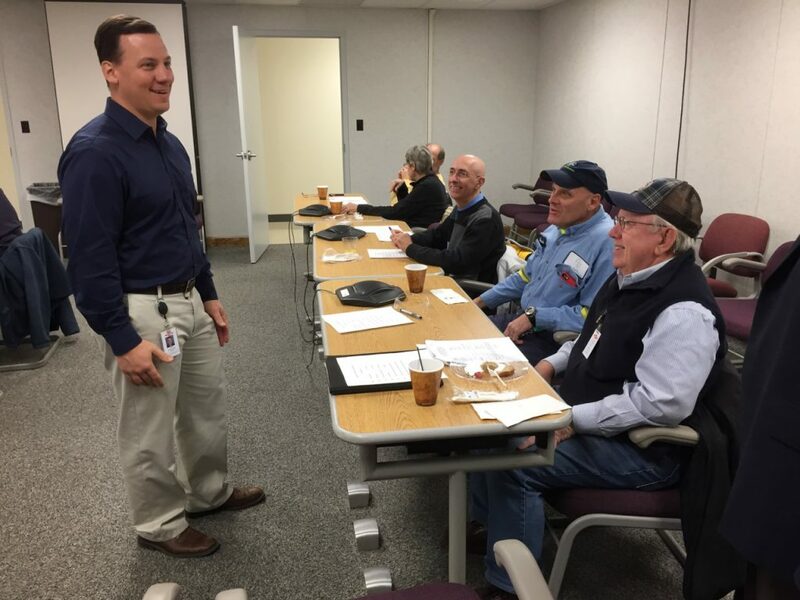 John Putnam, of Dow Chemical, welcomes pantry and United Food Operation representatives to Dow’s conference room at the Institute Industrial Park. John Putnam, responsible care leader for Dow Chemical Co. at Institute, welcomed the representatives to the meeting and expressed Dow’s continued support for the work of United Food Operation. UFO Chair Elaine Harris thanked Dow and the organization’s other supporters for their financial contributions and volunteer help. Dow and Bayer Crop Science combined to provide UFO’s warehouse and food distribution center at the Institute Industrial Park. Chairperson Elaine Harris leads the discussion of food needs. A number of fundraising ideas were discussed for the upcoming food distribution campaign. A representative of the Communication Workers of America presented an idea that would conduct a large fundraising event at the Mardi Gras Casino in Nitro. The all-volunteer United Food Operation has been supporting food pantries in Kanawha and Putnam counties for the past 35 years.